The holidays are over and here we are in a new year with a fresh start. For some, purchasing a new home may be on the radar for the new year. Whether to accommodate a growing family or downsizing after the kids go to college, there are a few things to keep in mind if you are considering a big move. It might sound overwhelming, but the best way to ensure your move goes smoothly is to have an organizational game plan from the start. There are a few things to consider as you plan your moving strategy. Consider the size of your new home. This is especially important if you are downsizing. If your new home is smaller than your existing home, it will likely be necessary to downsize your personal belongings. Take a look at each room to determine what may or may not make the move with you. 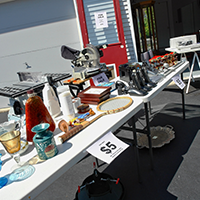 Look to sell or donate items that are no longer needed or useful. If your new home will be larger than your existing home, making a plan for how you will fill the additional new living space will make it less daunting after you move in. Think about where your belongings will go in your new home. As you begin to pack up your house, it’s human nature to pack things that are currently in the same room in the same box. This works well if these items will stay in the same room at the new house. For the ease of unpacking, pack your belongings in a manner that makes for unpacking. For example, if you no longer want that junk drawer in your kitchen, empty it out as you are packing and pack the individual items according to where you want them to go in your new house. Clearly label all boxes. Don’t be afraid to ask for outside help. If it’s within your budget and the thought of preparing for your move is overwhelming, there are professionals out there (like us!) who are here to help. Professional organizing services can help set up a customized moving and unpacking strategy that works for you and your family, minimizing the stress of your move. Direction, direction, direction. As the boxes are coming off the truck, take the time to read the labels to determine what room the boxes need to be put in for unpacking. 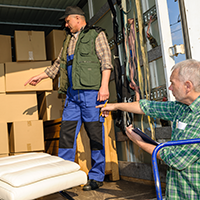 If you are unable to be there as items are unloaded from the moving truck, request a central location (the garage or basement, for example) for all boxes to be put in so that they can be moved to the proper room when time allows. Plan time to unpack. Scheduling time to unpack may seem silly, but finding time between work and family responsibilities can be a challenge. Unfortunately, life doesn’t stop for a move. Coordinating schedules with the members of your household will ensure a focused team-effort to get settled into your new house. Be intentional as you unpack. Having a plan for what rooms to unpack first will also help. For example, unpacking the kitchen first will help ensure you have a settled gathering place for your family in the midst of moving chaos. It can also save you the expense of eating out! Depending on your personality and belongings, it may make sense to complete one room at a time or do all similar rooms at the same time (bedrooms, bathrooms, etc.). Lastly, break down boxes as you go and have a designated area for storing them until they can be recycled. We understand the process of moving can be exciting but also a little overwhelming. Keeping the tips above in mind can help you feel settled in a matter of hours or days instead of weeks or months. Happy moving!